Carlos Fraenkel is Associate Professor at McGill University, jointly appointed in the Departments of Philosophy and Jewish Studies. At the beginning of March, he came to ECLA of Bard to talk about his new book and project: “Teaching Plato in Palestine.” The book is based on his experimental method of teaching philosophy to five different communities across the world (Palestinian, Islamic, Hasidic, Afro-Brazilian and Mohawk). Prof. Fraenkel started his lecture with a very inspiring anecdote from his own life. He recounted how, during his undergraduate years, he traveled to Egypt in order to study Arabic. While he was living there, he became friends with Egyptian Muslims and every evening around the dinner table they would discuss their different backgrounds and value systems. On every occasion, Fraenkel tried to defend his secular modern values, which disproved of the existence of an afterlife, while his Muslim friends believed in life after death. They all debated the existence of God and the supporting evidence. 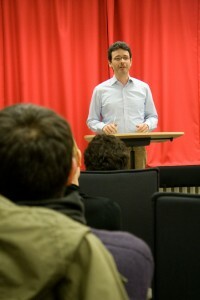 These discussions led both parties to defend and advocate their distinct value systems even stronger, which prompted a subtle conclusion in Fraenkel’s mind: this mode of debating and arguing was basically very beneficial, since it gave all the participants a chance to defend their beliefs and, in doing so, they were fortifying the underlying reasons. This conclusion led Fraenkel to dig deeper into the tradition of debate that existed during the Middle Ages. His research not only explored Western scholarship, but also investigated how Muslim philosophers and scholars dealt with the concept of debate. Fraenkel gave us the example of Al-Ghazali, a Muslim scholar from the 11th century who constantly wrote on the subject of Taqleed. “Taqleed” means the value system one adopts by default, due to one’s upbringing and education. For Al-Ghazali and Fraenkel, Taqleed may come in the way of accepting and even tolerating the views of the other. Fraenkel shared many anecdotes from the times of the Muslim rule in Europe, when debates and arguments were organized between scholars from different religions in order to encourage people to become more tolerant toward the ideas of the others. The core reason behind arguing and defending one’s own religious ideas was to encourage people to think more about what they themselves believed in. This way of arguing helped people consolidate their own belief system outside the blind following of the culture and religion they were brought up in. Fraenkel then described the project that he launched in Brazil and then in Palestine following the same line of thought. In these communities, he introduced high school students to Platonic texts, in order to help them think and argue in a larger framework, outside their own belief systems. According to Fraenkel, his teaching experience at a Palestinian university in East Jerusalem was very fruitful in starting a debate between Israelis and Palestinians regarding their long-held beliefs and ideas. The lecture ended on a merry note by encouraging the audience to constantly meditate on their own ideas, in order to have good arguments in their defense when the occasion arises.